The market opening time greatly influences the currency pair, which leads to a rapid movement of the pair. The EA places 2 pending buy and sell orders at a specified time with certain parameters. 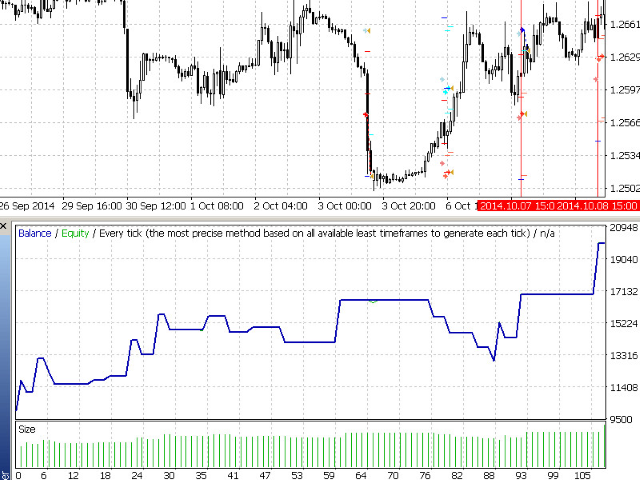 When the KolBarExtr parameter is set, the orders are placed at the High and Low for the specified amount of bars. Otherwise the orders are placed at the distance specified in the MinDistanceSet parameter. It is possible to configure trailing. Type of expert - Accepts the values "Run expert every day" or "Run expert only once". Type of time - Accepts the values "Local Time" or "Server Time". Time of orders installation - Order placement time. Time of orders pre-installation (min) - If greater than 0, the orders will be placed the specified number of minutes before the specified time. Time before deleting orders (min) - Deletes the pending orders after the specified number of minutes. 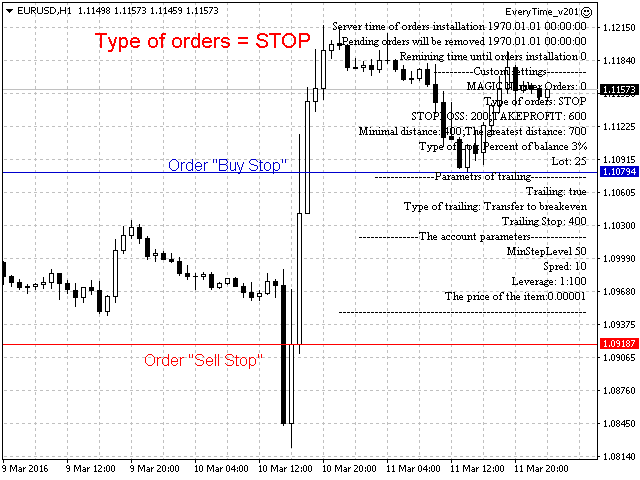 Type of orders - Accepts the values "StopOrder" (the "Buy Stop" and "Sell Stop" orders are placed) or "LimitOrder" (the "Buy Limit" and "Sell Limit" orders are placed). Type of OrderMagicNumber - Type of the used identifier for opened orders. "AutoGenerate Magic Number" (automatically generated), "Fixed Magic" (fixed value from the "Magic Number" parameter). Magic Number - Identifier of the opened orders. Use only if "Type of OrderMagicNumber"="Fixed Magic". Type of lot - Accepts the values "Fixed Lot" or "Percent of balance". Lot (or percent) - The value depends on the "Type of lot" parameter selected. StopLoss (points) - Stop loss in points. TakeProfit (points) - Take profit in points. Type of Distance - Type of the used distance for placing orders. Accepts the values "Static" (calculated as ("Min distance"+"Max distance")/2) "Extremum" (calculated as the High or Low price for the number of bars specified in the "Analyzed number of bars" parameter) "MaxBar" (calculates the maximum rising or falling bar for the number of bars specified in the "Analyzed number of bars" parameter). Analyzed number of bars - The number of candles to analyze. Min distance (points) - The minimum distance from the current price at which the order is placed. Max distance (points) - The maximum distance from the current price at which the order is placed. Modify of orders - Enable or disable the automatic modification of the placed orders. Use Trailing - Enable or disable the use of trailing stop. Type of Trailing - the type of trailing used. "Profit Trailing" - use trailing only when the current price exceeds the position opening price. "Loss Trailing" - always use trailing. "Transfer to breakeven" - transfer the position to breakeven immediately. "At the max/min price of the current bar" - the stop is set to the High or the Low price of the current bar, depending on the opened position. 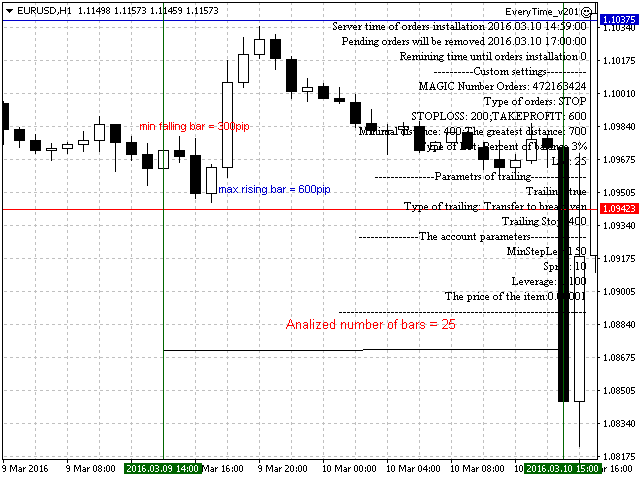 TrailingStop (points) - distance from the current price to the stop in points. So far so good, i like EA's with good logic, and ET has good logic. Just settings need to be refined. Fixed the order removal time calculation error. - Type EA - execution type, every day or once. - Start before (min) - time before the release of news to place orders. - Type Orders - type or orders opened (StopOrder - Buy Stop and Sell Stop, LimitOrder - Buy Limit and Sell Limit). - Type Magic - magic type ("AutoGenerate Magic" - magic is set as the chart ID the EA is attached to, "Fixed Magic" - magic is set in the "MAGIC" parameter). - Type Lot - lot type, affects the "Lots (or percent)" parameter. ("Fixed Lot" or "Percent of balance"). - MinDistance (pip) - if "KolBarExtr" is greater than 0, it sets the minimal distance in pips at which an order is placed. 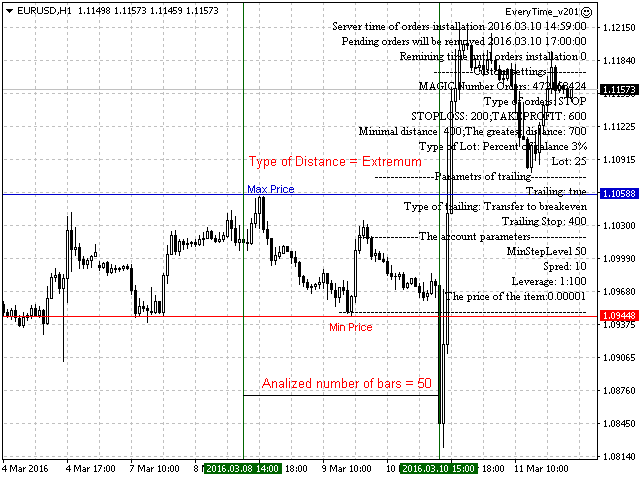 - MaxDistance (pip) - if "KolBarExtr" is greater than 0, sets the maximal distance in pips at which an order is placed. If "KolBarExtr" is 0, the distance is (MinDistance+MaxDistance)/2 (medium distance). - Modify - modify or not pending orders at a new candlestick or at the timeframe change. - Type Trailing - "Profit Trailing" trails only profit, "Loss Trailing" trails always, , "Immediately Profit" is used as breakeven. - Font color - color of the displayed text. Added the MAGIC parameter - order ID allowing you to launch several EAs that will manage only their own orders. Fixed removing of orders after a specified time expires.